Having lived in New England for more than twenty years, I’ve had my share of cod. It’s an unassuming fish, but one with great texture and subtle flavor. Here, the fish is coated in scallion-flavored panko, fried until golden, and served on red onions and chard. Chard is an underused vegetable—I think of it as a cross between spinach and kale—that when properly cooked, as here, brings raves. Preheat the oven to 350°F. Put the flour, eggs and panko in separate shallow dishes. Add the white pepper and garlic powder to the flour and blend. Beat the eggs with 2 tablespoons water until well combined. Add all but 3 tablespoons of the scallion greens to the panko and stir to mix. Dry the cod with paper towels and season with salt and pepper. Dredge the cod in the flour, dip in the egg, drain excess, then dredge in the panko mixture. Transfer to a large plate. Heat a large ovenproof sauté pan over medium-high heat. Add 2 tablespoons of the oil and swirl to coat the pan. When the oil is hot, add the fish and sauté, turning once, until golden, about 1 minute per side. Transfer to a large plate and set aside. Wipe out the pan, add 1 tablespoon oil, and swirl to coat the pan. When the oil is hot, add the scallion whites, onions and ginger and sauté, stirring, until the onions are soft, about 2 minutes. Add the chard stems and sauté for 30 seconds, stirring, then add the leaves. Season with salt and pepper, add the lemon juice and zest and sauté, stirring, until the chard has started to soften, about 1 minute. Top with the fish, transfer to the oven and bake until the fish is just cooked through, with an internal temperature of 130°F, 10 to 12 minutes. 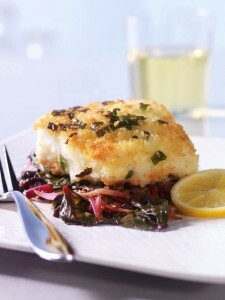 Transfer the chard to serving plates and top with the cod. 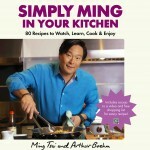 Drizzle with the remaining 1 tablespoon oil, garnish with the scallion greens, and serve with the lemon slices on the side.